Please Take Our Short Online Survey! I'm hoping you can take a minute out of your busy day to complete a short online survey for me. This quick survey has 10 questions that are designed to help me better understand which crafts you most enjoy and what kits you would like to see in the future. Your feedback is so important to me! I thank you in advance for taking the time to let me know how we can best serve you! I have been busy this week adding more new products to WeekendKits.com. Be sure to stop by our What's New page to see all the new items. Spring is coming...I promise! It has been a long hard winter in most parts of the country, especially here in the northeast, but I am beginning to see a few signs of spring this week. The snow banks are almost melted and the robins are returning. These beautiful Song Birds will help cheer them along! This hand embroidery iron-on pattern from Sublime Stitching, called Song Birds, will make it easy for you to add a touch of spring to your hand embroidery projects! We carry a broad selection of modern and traditional hand embroidery patterns from Sublime Stitching. If birds aren't your thing...how about some crazy space motifs! The designers at Sublime Stitching are widely known for their fun and offbeat modern designs. 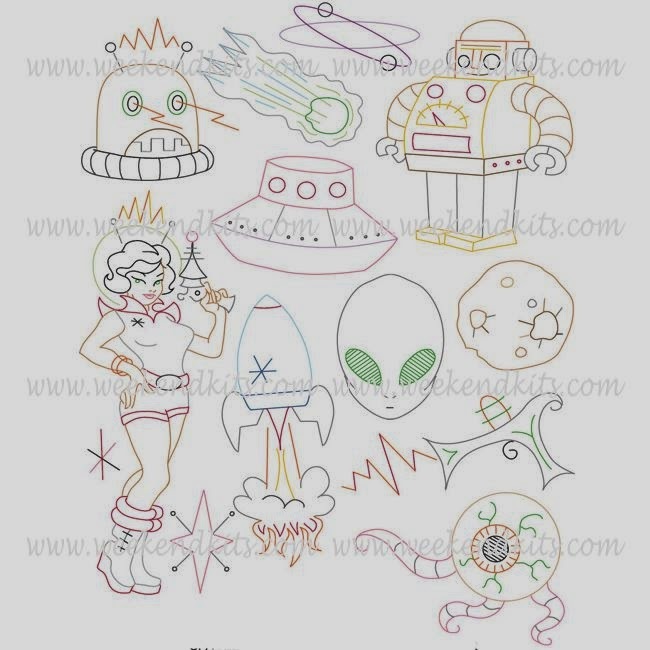 This iron-on embroidery pack called Spaced Out would look so cool in a youngster's room, on a bib, or on a T-Shirt. It's great to see hand embroidery making such a come back! These patterns are reusable and you can normally get several imprints from one iron-on pattern. When the transfer ink is used up on the pattern, it's easy to use one of our embroidery transfer pens to make the transfer useable again. We offer the DMC Embroidery Transfer Pen which allows you to trace the design directly from the pattern on to the fabric. The ink in this pen is water soluble so it will wash right out! 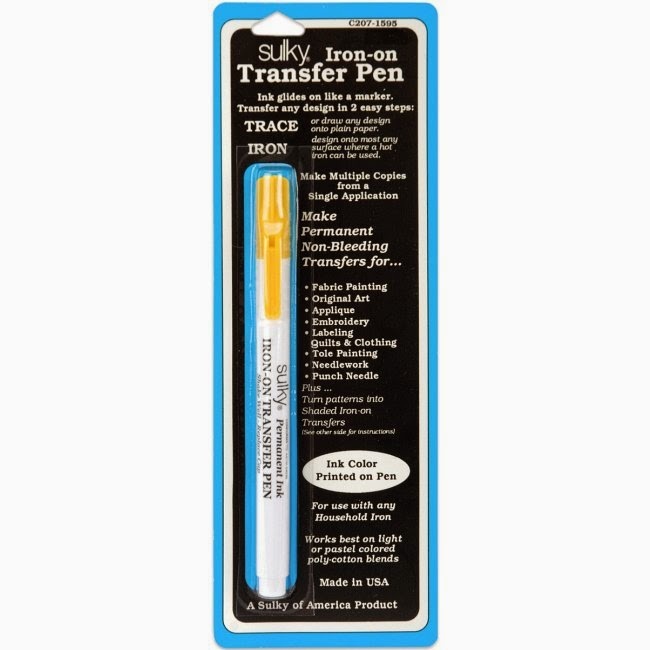 If you prefer the iron-on transfer method, we also offer the Sulky Iron-On Transfer Pen which allows you to trace over the lines on the paper pattern to create a fresh iron-on transfer! 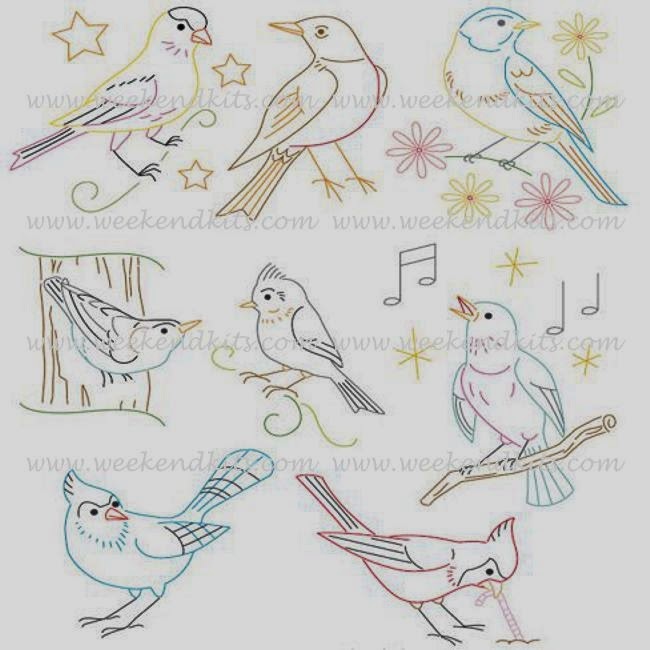 I plan to embellish some guest towels with these cheerful song birds. 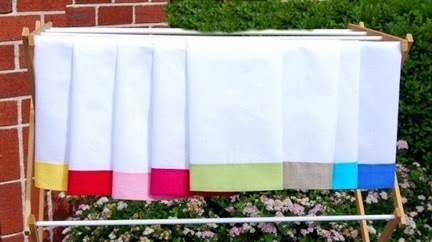 Our sister website EmbroiderThis.com has a wide selection of blank items for embroidery, including these Classic Colored Border Guest Towels. Embroidering with a simple outline stitch, like a back-stitch, will make it easy and quick to create a whole set! I am working on compiling some new kits that will contain iron-on patterns, embroidery floss, and needles from Weekendkits.com along with blank linens for embroidery from EmbroiderThis.com. Watch for these new kits coming soon! Until then, you can order the individual products from Weekendkits.com and EmbroiderThis.com. Happy Stitching and remember to Click Here to Take the Survey! Spring is just around the corner and my thoughts are turning to the beautiful flowers and trees that will soon be blooming! This lovely Tree Crewel Embroidery Kit seemed like the perfect spring kit to help me illustrate some Hand Embroidery basics. If you have always wanted to do hand embroidery and had not one to show you the ropes, or if you are an experienced stitcher looking for a refresher course, you have come to the right place! Using this beautiful wool embroidery kit I will take you from your first stitches to finishing the project. So lets get started! 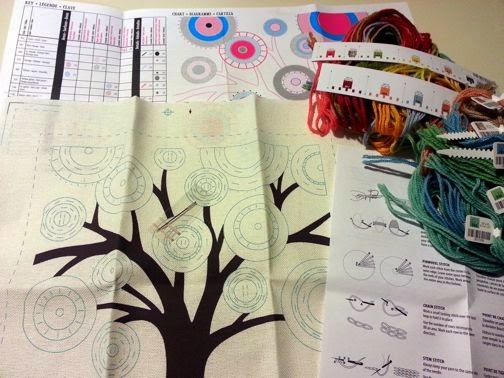 The techniques and tips presented in this blog tutorial will apply not only to the featured Tree Hand Crewel Embroidery Kit, but can be applied to most of your hand embroidery projects as well! At WeekendKits.com, we offer a wide variety of Hand Embroidery Kits in many different techniques such as Crewel Embroidery, Counted Cross Stitch Embroidery, Stamped Cross Stitch, Traditional Hand Embroidery using stranded thread known as floss, as well as Beaded Embroidery Kits. Click here to see our full selection of Hand Embroidery Kits for both adults and children of all skill levels. Pick one and join me in this easy and rewarding craft! We can stitch along together! First, what’s in the package? Each kit offered on WeekendKits.com will list the exact components provided in that particular kit. 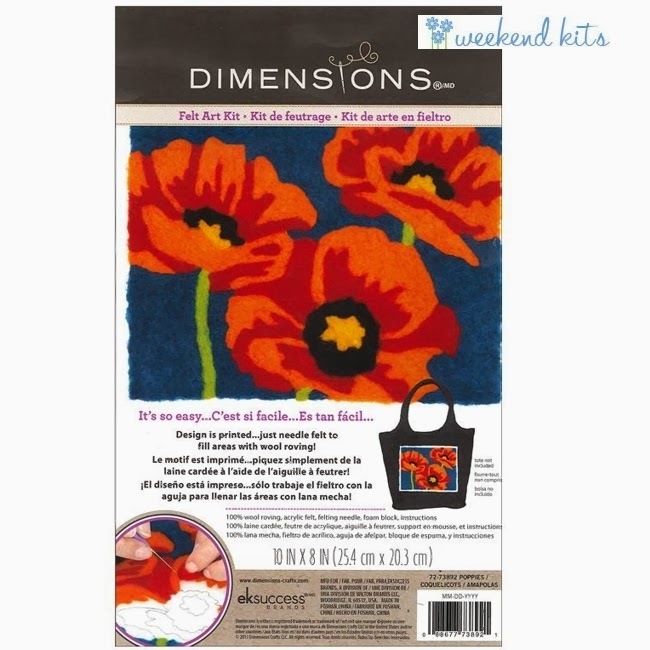 Needlework kits from Dimensions are among my favorites because all the products included are always top quality, the designs are absolutely stunning, and the directions are complete and easy to follow. In this kit they have even pre-sorted and pre-labeled all of the yarns for you. Talk about service and convenience! What else do I need that is not in the kit? For this project, you will also need an embroidery hoop and a pair of small sharp scissors. You may also find a needle threader quite convenient and desirable! A needle is included with your kit, but I recommend having a few extra needles on hand just in case. Luckily, you can find all these products readily available on Weekendkits.com! The base fabric for this project is a sturdy cotton even-weave fabric that has the tree trunk and the outline for the circles that form the “leaves” of the tree pre-stamped on the fabric. That means you don't have to worry about transferring the design to the fabric! The pre-stamped design saves you time and makes the placement of your stitches so easy. It gets you to the fun part, the stitching, faster! As you stitch, the yarn will cover the stamped lines so they will not be visible in the finished project. Even-weave fabric is woven so the threads running up and down (warp thread) are evenly spaced with the threads running across (weft thread) the piece of fabric. The weave of this fabric is a bit open so small holes appear in the weave of the fabric giving you an easy “in” for your needle! Crewel embroidery stitch placement is a bit looser in interpretation than other types of hand embroidery like counted cross stitch. You don’t need to go in the exact hole where the line in the design falls. A hole beside the line is fine. In crewel embroidery the objective is to cover the stamped design area with stitching and to use the stamped lines to help you form the proper shape for the design element. The pressure is off! You will notice that the fabric the design is printed on is larger than the actual finished design of the project. This extra fabric allows you plenty of room to put the fabric in your hoop while keeping the stitching area away from the edge and makes it more comfortable for you to stitch. It also will allow you to obtain better fabric tension in the hoop. This extra fabric also provides you with a margin to neatly hem the edges on your finished project if you wish. Notice the dashed lines around the edge of the fabric marking a 1/2 inch seam allowance for your finished project. More on that later! Iron the Fabric: I used a medium heat iron without steam and a damp pressing cloth to iron this fabric. The pressing cloth helps iron out the fold marks without excessive heat. A pressing cloth can be any lightweight white or off-white fabric like muslin, quilter’s cotton or even a cotton handkerchief. Spray the pressing cloth with water to dampen. 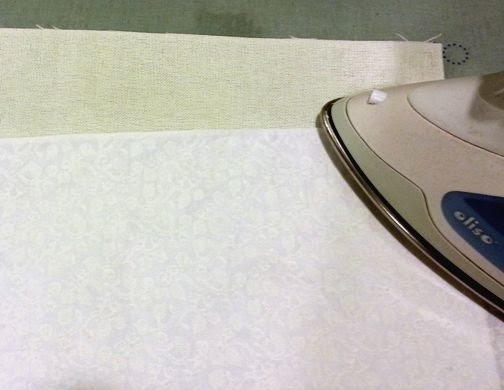 Place the design fabric right side down on your ironing board, lay the damp press cloth over the top and press gently. The damp pressing cloth creates a very gentle steam that will take out the wrinkles without stressing the fabric or disturbing the stamped lines on the other side. Note: Always read the instructions that come with your kit. Irons should not be used on some designs. Read the manufacturers recommendations before ironing to be sure you won’t scorch, smear, or remove the design lines with your iron! To prevent the fabric edges from fraying while you work, the directions in this kit recommend that you stitch the raw edges using a zig-zag stitch. I have found that covering the edges with tape, like masking or painter’s tape, is faster and easier than stitching! Use either method to secure the edges of the fabric before beginning this project. 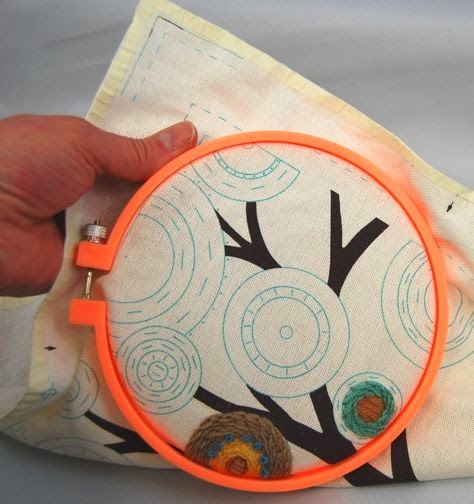 The fabric for this project should be placed in a hoop for stitching. 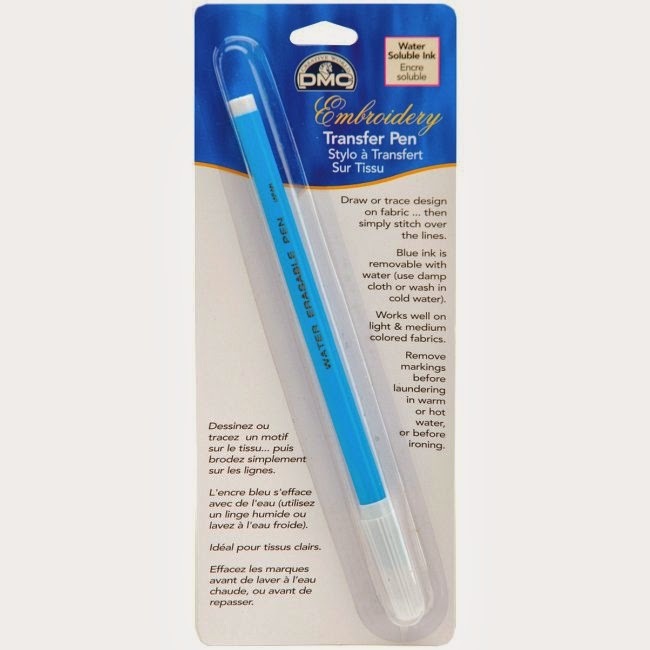 This allows you to keep the tension of your stitches consistent, light, and even. A hoop is not included with this kit but we carry a range of hoop sizes at Weekendkits.com so you can order the hoop you need when you order a kit. Most hand embroidery projects benefit from hooping the work. What size hoop should you choose for a project? Which hoop size do I choose? The hoop size should be proportional to the project size and complexity as well as to your experience and comfort level. A very small hoop works well for little projects without much detail, a large hoop works great for large open designs, while a medium hoop (size 6”-8”) works best for a medium sized design like this one. This size hoop will give you plenty of area to work while providing even tension on the entire work area, and allow you a comfortable grip on both the hoop and your work. 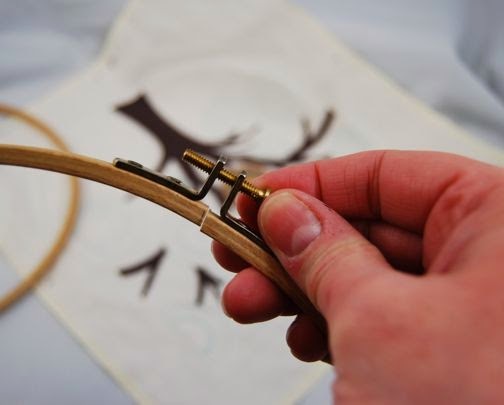 When you stitch, your non-dominant hand will be holding the hoop and assisting in the formation of the stitch, while your dominant hand performs the actual stitch. 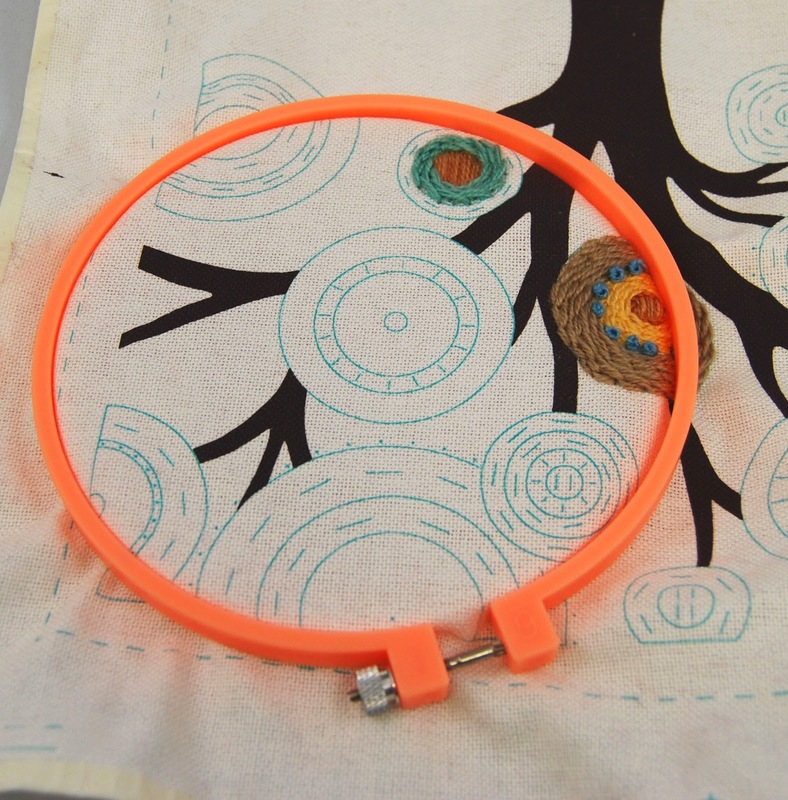 The wrong sized hoop for the project can result in an awkward or uncomfortable stitching experience, and hand fatigue. 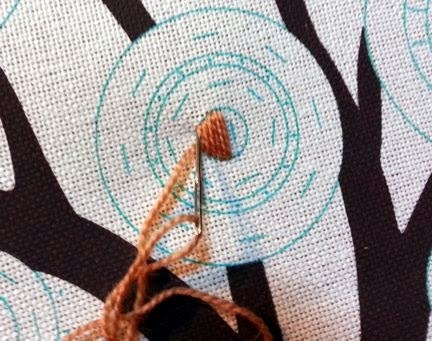 If you have ever found stitching uncomfortable in the past I'll bet you just had the wrong sized hoop for the project! Embroidery hoops most often have an inner solid ring, and an outer adjustable ring that is a bit larger than the inner ring. The outer ring adjustment is often made by use of a thumb screw. 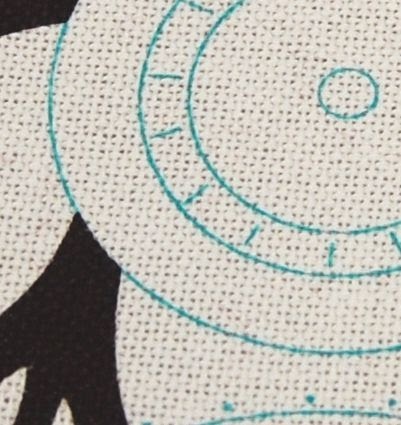 The outer ring can be adjusted to provide even tension on a variety of fabric as well as the thickness of your embroidery stitches as your piece progresses. When hooping the fabric, work on a flat firm surface like a table. To load the fabric in the hoop (also known as hooping the fabric), place the smaller inner hoop on the table. Center the area you wish to embroider on the fabric over the top of this inner hoop. Loosen the thumb screw on the larger outer hoop ring. Gently press the outer ring down over the inner ring sandwiching the fabric in between. If you are having difficulty getting the outer ring over the inner ring, loosen the thumbscrew a bit more. The edges of the inner hoop should be flush with the edges of the outer hoop when the two are seated properly. Gently and evenly tug the fabric taut around the edges of the hoop until there is even tension on the fabric, then finger tighten the thumb screw. Use care when positioning the hoop over areas that have already been stitched. I find that placing the outer hoop over the areas that have already been stitched first, then rolling the rest of the hoop into place causes the least amount of stress to existing stitches. It is not necessary for the fabric to be drum tight. You want the fabric to have some “give” so you can move the needle in and out of the fabric more easily. Do not over-tighten the thumb screw, just tighten as much as you can comfortably do with your fingers. Crewel Embroidery is also known as Wool Embroidery because wool yarns are used to stitch the motifs on fabric. 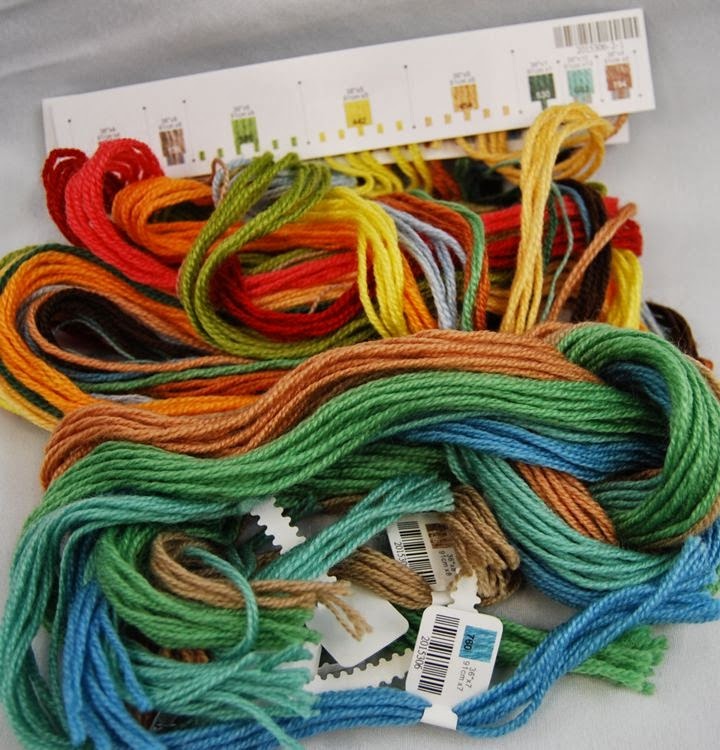 This kit includes beautiful 3-ply wool yarns that have been pre-sorted and labeled for your convenience. 3-Ply means that each length of yarn is actually made up of 3 individual plies, or strands that have been twisted together. 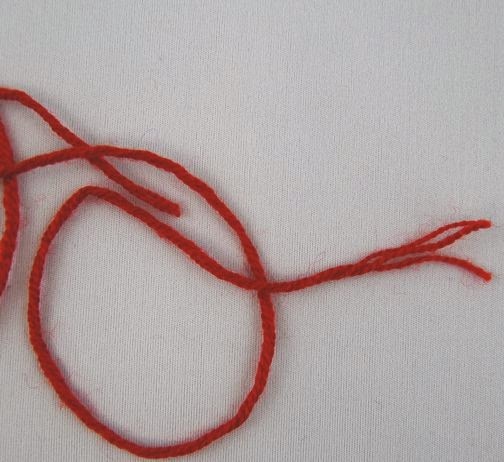 Embroidery stitches are made using a variable number of these individual strands. Some stitches use just one strand from the 3 ply bundle, others two, and sometimes all three strands will be used in a single stitch (although not in this kit!). The pattern chart will tell you how many strands of the 3 ply to use for each individual stitch in this design. The kit directions also recommend you cut the provided yarn lengths in half before stitching. This shorter length is less likely to tangle and is easier for a beginning stitcher to manage. A shorter length of yarn is less likely to tangle when separating the 3 ply yarn as well. To separate the strands in a length of yarn simply untwist the yarn a bit at one end and gently pull the strands apart. You will find that letting the length of yarn hang free and untwist as you pull makes separating the strands easier. Go slowly so the threads don’t tangle or form knots as you separate the strands. Coax the yarns apart with your fingers if needed. 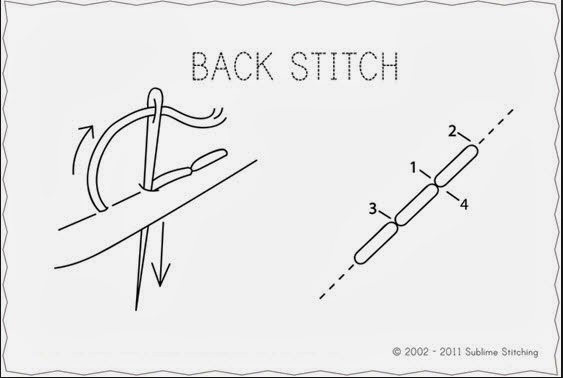 It is advisable to separate all three strands, then if two strands are required for your stitch, put them back together side by side, untwisted, for so the strands lay properly in the design and provide the best coverage of the design area. This kit comes with a large eye embroidery needle. A needle threader is the fastest and easiest way to thread the needle and we carry a great needle threader from DMC at Weekend Kits.com. 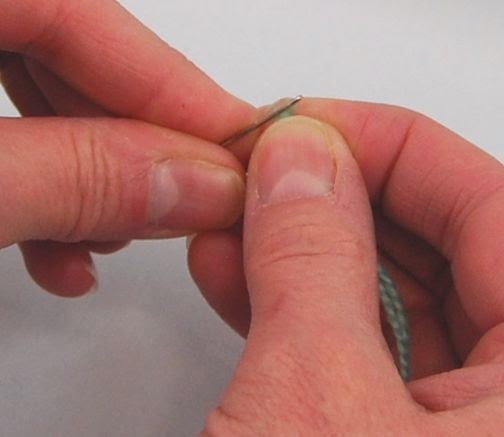 If you don’t have a needle threader, the following tips may help you thread the needle by hand. Wool Yarns can be a bit tricky to thread through the eye of a needle since wetting the ends may cause them to “bloom” and fray rather than lay down! I begin by trimming the ends of the yarn that will pass through the eye of the needle so they are even and have a good crisp edge, then pinch the threads firmly between my thumb and first finger so just the smallest amount of yarn end is peeking out. While keeping my fingers pinched, I press the eye of the needle against the ends and wiggle a bit. Pressing the eye of the needle into the yarn ends works much better than trying to push the squishy ends into the eye of the needle. If I don’t get it in two tries, I re-trim the ends before trying again. Sometimes I have luck getting just one of the strands out of two through the eye. When this happens, I slide the thread that has gone through the needle down the eye out of the way and then proceed to work the remaining strand through the eye. Finally the preparation work is done and it's time to stitch! 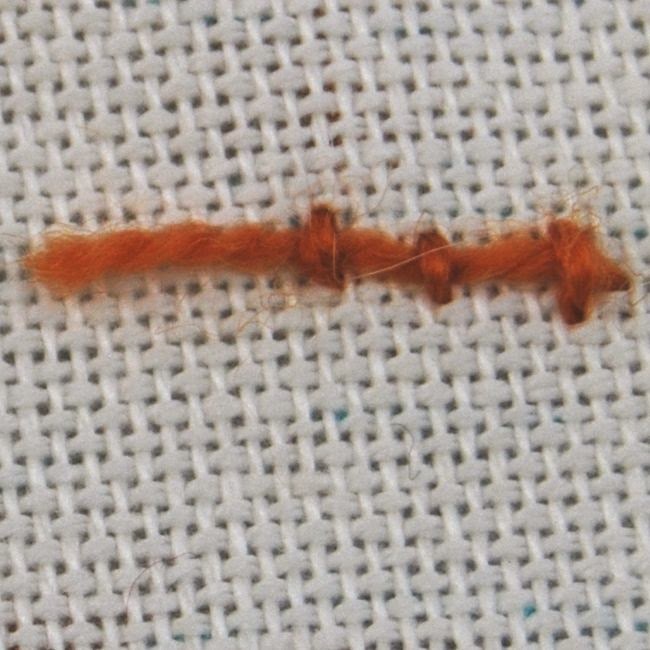 Knotting the thread ends is not recommended when doing hand embroidery since the knot may form a bump on the back that can be seen from the front of the work or may create a shadow through from the back of the work to the front. The best method to secure the tail end of your embroidery thread is to leave a 3-4” tail of thread in back when you take your first stitch. Then tuck this tail into the backside of your next three or four stitches as you pull them tight to secure the tail end. Trim tail after thread end is secured. 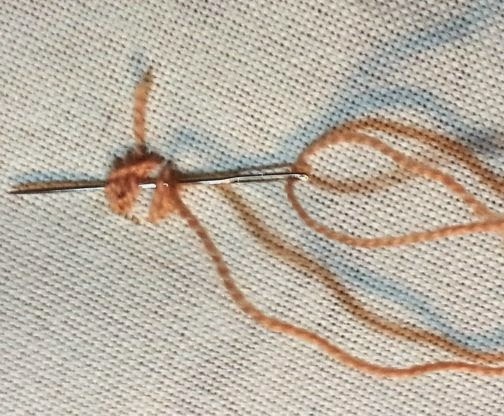 Ending a Stitch: Use a similar technique when ending a stitch. Don’t knot the thread, simply pass the needle under three or four stitches on the back side of your work to secure the thread then trim the end. Satin stitching is one of the first stitches you will encounter with hand embroidery. This versatile stitch is a wonderful fill stitch for many sized areas. To help keep your stitches straight and even, start in the middle of the shape and work toward one edge. Once that side is filled, go back to the center and work in the opposite direction. Bring your needle up at one edge of the design area to be filled and go back into the fabric directly opposite where the thread came out on the other side of the area to be filled. Stitches should be kept parallel and spaced so the threads lie next to each other without overlapping or showing the fabric below. You will quickly see that the width of the stitches used when satin stitching will be equal to the width of the thread(s) you are stitching with! I hope I have inspired you to start stitching with a Crewel Embroidery Kit today! 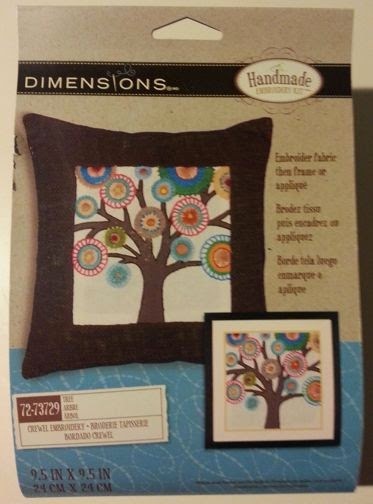 The Trees Crewel Embroidery Kit from Dimensions combines traditional crewel embroidery techniques with modern design for a stunning finished piece. I will keep you updated on my stitching progress and provide more hand stitching tutorials soon! 6 New Kits Added to WeekendKits.com Today! You are going to love all the new kits coming soon to WeekendKits.com! I have been busy ordering up a storm and can't wait to get all the new items posted to the website! Just today I put up 6 new items in a brand new category called Needle Felting Kits. Needle Felting is a simple craft that produces extraordinary results! Needle Felting uses un-spun wool roving and a special barbed needle to create a wide variety of items. 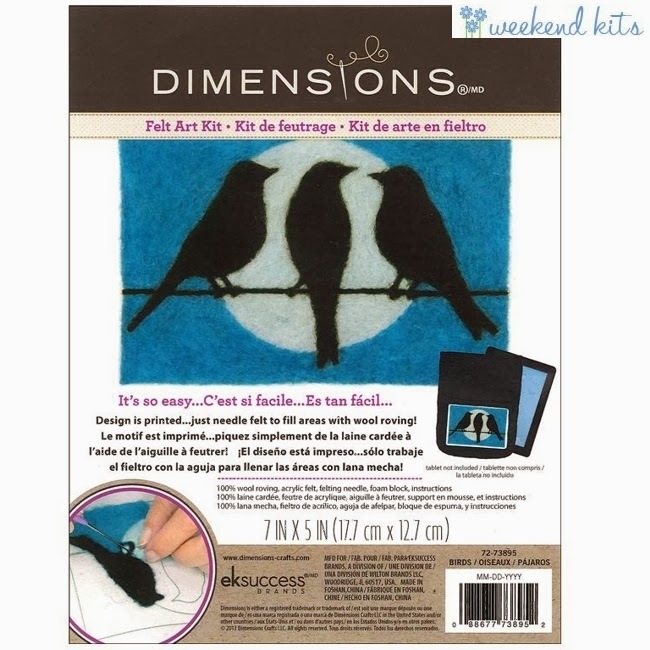 Some kits come with a foam block or a piece of felt to provide a base for your felting action. Other kits come with a stencil or molded shape to assist you in obtaining a perfectly shaped finished product! Wool Roving is a long narrow strip of 100% Wool fiber that has been smoothed out but not yet twisted into yarn. The wool roving used in these needle felting kits are dyed bright colors to suit the pattern. The special needles used for needle felting have sharp barbs on the lower end of the needle that when pushed and pulled out of the fibers cause the fibers to bind together or "felt". The agitation and friction of the barbs causes the wool fibers to mat together forming a tight bond. The felting needle compacts the fibers and causes them to compress into a firm shape. The more you poke with the needle, the more compressed the fibers become so it's easy to shape the wool roving. If you don't like how a shape is coming, it's easy to add more wool, pull some off, or simply poke some more to make the shape what you want! It is a very forgiving craft and quite fun after a long hard day at the office! You can create many items from this simple needle felting technique including 3 dimensional characters, shaped ornamental pieces, and flat pictorial scenes. 3-D pieces make great ornaments, key fobs, pins, or a small gift for a friend. The shaped ornamental pieces are terrific to hang as ornaments from a key chain, book bag, or in a sunny window. They brighten any room! 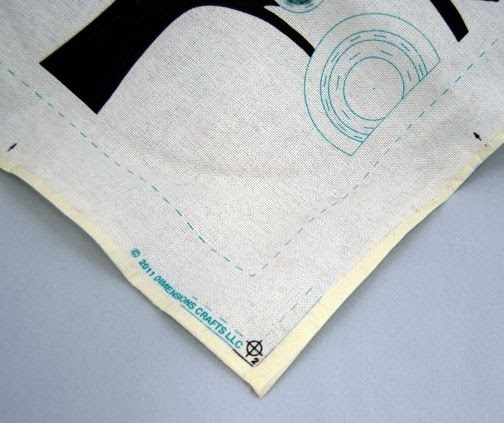 Flat pieces can be framed as a decorative picture or can be sewn (or felted) to another item such as a tote bag, hand bag, knitting bag, or garment. Let your imagination run free and see what you can do with your needle felted creation! Do use caution though because the needles are sharp! 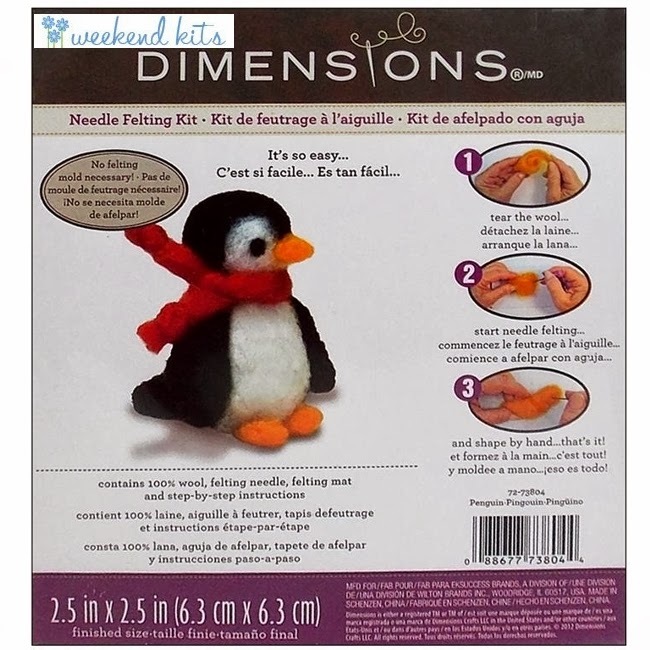 Explore all 6 Needle Felting Kits that have been added to WeekendKits.com today including the Poppies Needle Felting Kit, Penguin Needle Felting Kit, Birds on a Wire Needle Felting Kit, Bluebird Needle Felting Kit, Flower Needle Felting Kit, and the (oh so adorable!) Owl Needle Felting Kit. More Needle Felting Kits and more Brand New Kits in many other categories will be uploaded almost daily over the next few weeks so check back soon! Labels: needle felting, needle felting kits, new kits!